Pay attention, everyone. This is a watershed moment. 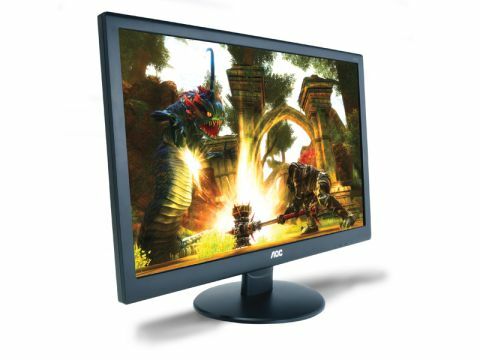 The AOC i2352Vh is a Full HD 23-inch PC monitor. And it's yours for around £130. So far, so unusual for a contemporary PC monitor. But here's the really dramatic thing: it's got an IPS panel. This is by far and away the most affordable IPS monitor we've ever seen. It's something we've been begging for. Finally, triumphantly, AOC has delivered. Of course, IPS and other premium panel technologies have been becoming much more accessible of late. We reckon much of this is down to Apple's use of IPS LCD panel technology in its iPhones, iPads and iMacs. A label reading 'IPS' is now something that punters vaguely recognise, even if they don't understand what it really means. But the likes of the ViewSonic VP2365-LED or the Asus PA238Q are £200 or more. It's a big difference. At this price point, something has to give. For starters, it's a little odd to see the AOC i2352Vh has a cheap-looking chassis, knowing that an IPS panel resides therein. The overall ambience is positively frills-free. The enclosure is composed of coarse, plain-looking plastic, and the stand is a resolutely tilt-only affair. Give the top of the screen a prod and the whole ensemble rocks back and forth pretty alarmingly. But if it delivers where it really matters, that's probably tolerable. Certainly, the input options are covered. You have a choice of DVI, HDMI and VGA connections. So it all comes down to image quality. The good news is that it's recognisably IPS straight out of the box. The lovely colour balance and detail you expect from IPS is undeniably apparent. The TN-spanking viewing angles are clear to see, too. But will it hold up to closer inspection? Fire up the Lagom suite of test images and the AOC i2352Vh puts in a strong performance. There's plenty of detail in the white and black scales, for instance, and no evidence of banding or compression in gradient rendering. A dip into the viewing angle test confirms what we already knew - that this is the real IPS deal. Outright black levels are good, too, and there's relatively little evidence of those two IPS-related niggles of surface sparkle and IPS glow. Oh and the pixel response is more than adequate. But surely this cut-price screen can't be perfect? Well, there is one small flaw, and it's backlight bleed around the edges. It's not a major problem, but it's not something we're accustomed to seeing in an IPS screen. An IPS panel with an LED backlight for £130? Um, yes please. That the AOC i2352Vh doesn't just deliver on paper but also puts in a strong real-world viewing experience is deeply, deeply impressive. Now everyone can have a decent IPS screen. Hallelujah. The tilt-only stand is flimsy, the whole chassis looks and feels cheap, the OSD menu is poorly designed and the panel itself suffers from a little edge bleed. At £130 for some decent specs, this monitor is so preposterously parsimonious, we're willing to forgive its flaws. The holy grail of the truly affordable IPS screen has arrived. It's not perfect, but that hardly matters.